"Spicy brown mustard and deviled ham make these your not-so-traditional deviled eggs." Place egg in a saucepan and cover with cold water. Bring water to a boil and immediately remove from heat. Cover and let eggs stand in hot water for 10 to 12 minutes. Remove from hot water, cool, and peel. Cut eggs in half lengthwise, place the yolks into a mixing bowl, and set the whites aside. Mash the yolks with the deviled ham, mustard, mayonnaise, and black pepper. Spoon or pipe filling into egg white halves. 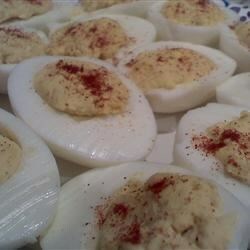 Garnish each deviled egg with an olive slice, then sprinkle with paprika. These are the best. Many compliments at the party I gave for my husbands Birthday. One friend said " Do I detect a taste from my childhood? I love it' The Underwood Ham! Very good twist on deviled eggs; what better ingredient than deviled ham? My family loved it & nobody could quite figure out what was in it. This is the best recipe on here. Also, the most basic, which is what I was looking for. I didn't add the olive, but these came out great, (also omitted the ham)!! These eggs are great. People were very surprised when I told them there is deviled ham in them. I will definitely make this recipe again. The deviled ham really made it perfect!